Are Anesthesiologists Finally Recognizing the Importance of Infection Control? New York—When it comes to the delivery of anesthesia care, infection control matters—and infectious disease professionals think it is high time their counterparts in anesthesiology recognize that. They should be pleased then that the issue was the topic of discussion during a session entitled “Infection Control Issues Impacting Anesthesia Practice: What’s the Evidence?” held here at the New York State Society of Anesthesiologists’ (NYSSA) 68th Annual PostGraduate Assembly (PGA) in Anesthesiology. The speakers emphasized the importance of infection control practices in the delivery of anesthesia by citing numerous examples. For instance, they noted that during anesthesia care Loftus RW et al (Anesth Analg. 2014 Jun 16. [Epub ahead of print]; PMID: 24937346) found a within- and between-case Enterococcus faecalis transmission rate of 11% to 23%; furthermore, several hepatitis B and C and other infectious outbreaks in health care settings over the past 15 years have been attributed to mishandling of medications, fluids, syringes, needles and cannulae by anesthesia professionals. However, the speakers also emphasized that some published infection control recommendations, including a provision of US Pharmacopeia (USP) Chapter <797>, for example, present unique challenges to anesthesia professionals. given him the disease, the Missouri Court of Appeals has ruled. blood and sucking on the other end to draw blood into it, records show. The widow of a heath care worker who died from complications related to his hepatitis C is entitled to benefits despite the fact that the man received a blood transfusion in 1970 that his employer argued could have given him the disease, the Missouri Court of Appeals has ruled. Stephen Smith worked for Capital Region Medical Center in Jefferson City, Missouri, as a medical laboratory technician from 1969 until March 2006, court records show. Mr. Smith and other health care workers didn’t wear protective equipment while handling blood and human tissue before safety measures were implemented in the 1980s or 1990s, according to court records. 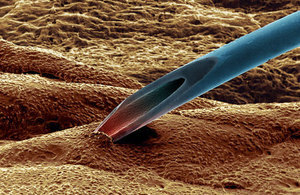 They also used a narrow glass straw, known as a pipette, to prepare blood slides by placing one end in a tube of blood and sucking on the other end to draw blood into it, records show. exposure to bloodborne viruses through occupational sharps injuries. increased among healthcare workers from 373 in 2004 to 496 in 2013.
source patient infected with HIV; 54% involved hepatitis C (HCV), and 9%, hepatitis B (HBV). majority of which were sharps injuries involving a hollow-bore needle. following occupational exposure in England, Wales and Northern Ireland. whom 7 are known to have achieved viral clearance. The report also finds that HBV immunisation programmes across England, Wales and Northern Ireland are effectively protecting healthcare workers from HBV infection, with no new cases reported. Furthermore, 97% of healthcare workers exposed to HIV who commenced post-exposure prophylaxis (PEP) did so within 72 hours of exposure, and no HIV infections to healthcare workers have been reported. and during disposal. These injuries are entirely preventable. effort to reduce sharps injuries and protect them from infection. staff in their correct use. be embedded into everyday practice. The eye of the needle is a report on healthcare workers’ exposures to bloodborne viruses such as hepatitis B, hepatitis C and HIV while at work. Read the full 2014 report. More information on the 5th POINTERS conference. intelligence, and the delivery of specialist public health services. PHE is an operationally autonomous executive agency of the Department of Health. www.gov.uk/phe Follow us on Twitter @PHE_uk. If regular manicures are your guilty pleasure, beware – they may be posing a risk to your health. are in violation of health and safety rules. to protect themselves against the disease. (6%), heroin (0.4%), and other opioids (1%).